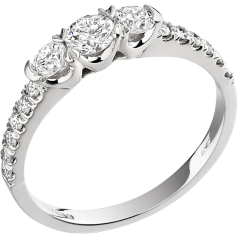 Three stone rings are popular as anniversary presents and pushing gifts, but in recent times are also frequently worn as engagement rings. 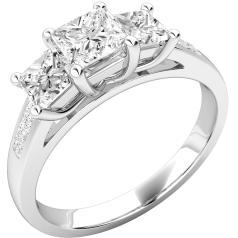 Simultaneously appeared the current of engagement rings with diamond set shoulders. 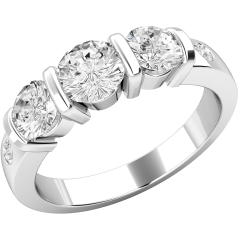 This way three stone rings with shoulders combine the best of both worlds. 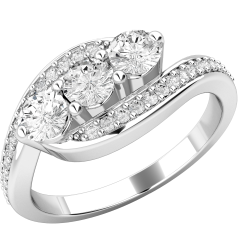 Selecting a three stone ring with shoulders means that you have the possibility to select different combinations of diamond shapes and sizes. 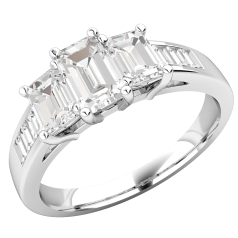 We offer three stone rings with shoulders set with the most popular shapes of diamonds: round Brilliant, Princess cut, Emerald & Baguette, Emerald & round, and Emerald cut & Trapezium. 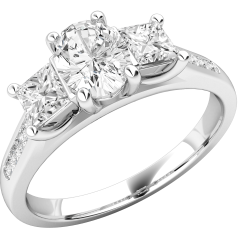 The central stones are usually in a claw or bar setting, while the shoulder stones are set in claw, channel, or rub-over setting for safety. 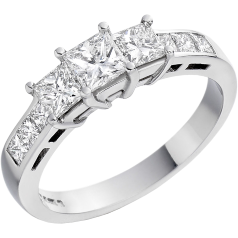 The small diamonds on the shoulders enhance the three central stones, and enrich the overall look of the ring. 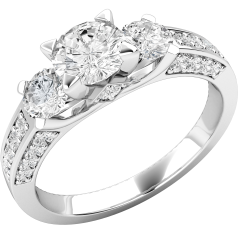 Shoulder stones give extra character to the ring, perfect for that special someone with spirited personality. 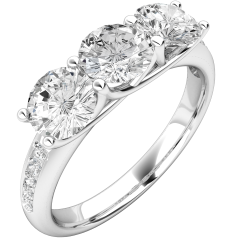 We offer our three stone rings with shoulders crafted in fine 18ct white gold and platinum.